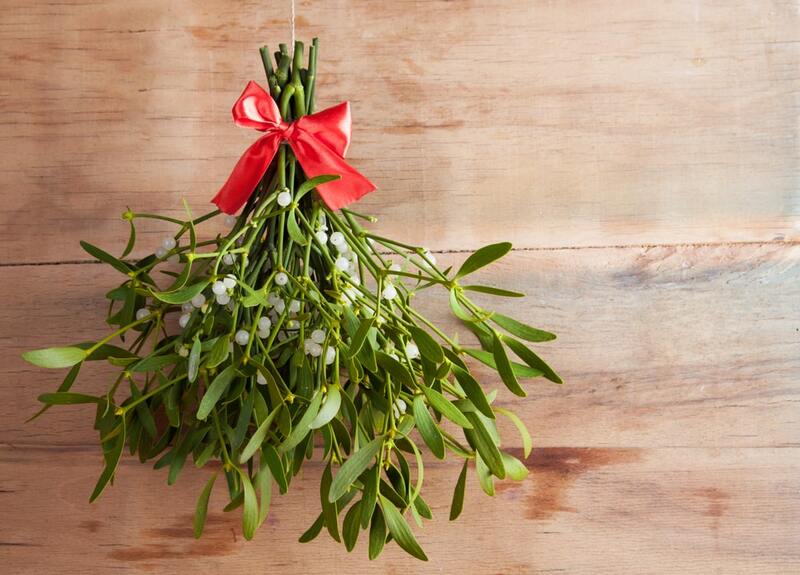 Hanging a sprig of mistletoe over your door this holiday season? Here are some interesting facts about this holiday staple. The botanical name for mistletoe is “phoradendron” which means tree thief. While mistletoe is capable of performing photosynthesis, it more commonly grows as a parasite, sending roots down into a tree to leech nutrients away. A heavy infestation can kill or seriously damage a tree. Most varieties produce a very sticky substance called viscin which can enable the seeds to stick to the feathers or fur of an animal. This sticky substance can also enable a seed to glue itself to the bark or a branch of a suitable host tree. Mistletoe flowers are a very rich source of both pollen and nectar for bees and other pollinators. Mistletoes are dioecious—meaning they have separate male and female plants. Only the female plants have berries. While mistletoe berries are highly toxic to humans and pets, they are an important food source for birds and other wildlife. As a matter of fact, several species of birds even prefer to make their nests in clumps of mistletoe. And it’s a host plant for several species of butterflies. There are over 1300 species of mistletoe worldwide, with over thirty native to the U.S. alone. Around 20 species are on the endangered species list so when harvesting from the wild, be sure which species you are harvesting. In ancient times, mistletoe was featured strongly in European folklore. Norse mythology had the goddess Frigg’s son, Balder, killed by an arrow made from mistletoe. When he was resurrected, she proclaimed that mistletoe would never again be used to hurt anyone. It would be a symbol of love and friendship. The Celtic druids considered it to be a symbol of prosperity and fertility and Scandanavians considered it a symbol of peace. While no one is sure how an ancient symbol became connected with the holidays, it has been associated with Christmas for several hundred years. It’s the time of year to purchase your Christmas trees, wreaths, poinsettias, and mistletoe. Stop by the Great Big Greenhouse and Nursery now for the best selection of holiday decorations. We’re here to help.